I caught pink eye this week, and fell behind my posting schedule, so today I’m playing catch up. Today’s first ink is J Herbin Vert de Gris. This ink was released this year, and is available in 10ml and 30ml bottles. Thanks to Pen Chalet for sending a bottle over for review. Vert de Gris is one of those colors that could fit in a few categories. In large swabs it looks more green/grey and in writing it looks more blue, so I’m going to call it a blue. In large swabs the in looks a lot more green/grey than it does in writing. Feathering: Low-there was some feathering in the flex nib on Rhodia. Ink swabs for comparison, left to right (top to bottom for mobile RSS): Birmingham Aluminum, J Herbin Vert de Gris, and Birmingham Fair Wheel Blue. 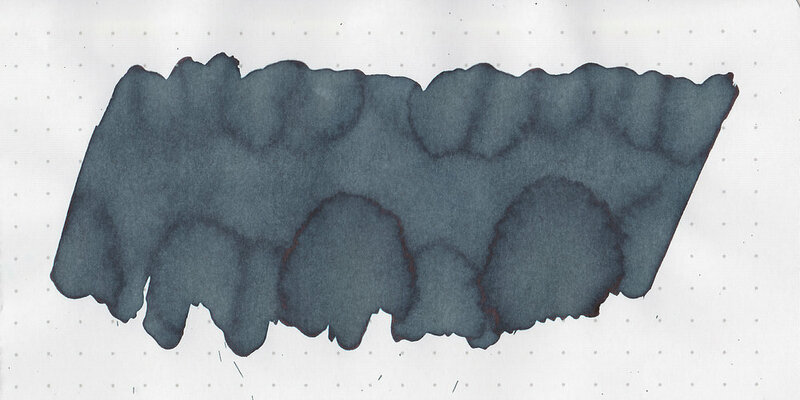 Click here to see the J Herbin inks together. Kyo-no-oto 7 Hisoku, Birmingham Polar Bear, and Krishna Monsoon Sky. Click here to see the blue inks together. I used a broad Pilot Vanishing Point Copper LE on an ivory Hippo Noto Notebook. The ink had an average flow. Overall, it’s pretty well behaved, and a unique color. I really enjoyed it in the broad Vanishing Point nib. Disclaimer: Thanks to Pen Chalet for providing a bottle for the purpose of this review. All photos and opinions are my own. This page does contain affiliate links, but is not sponsored in any way.